Is one club I never wanted to join. But it looks like I will be. Looks like at least a double bypass surgery will be required. I am still reeling from the day. Emotional roller coaster about sums it up. Wait time - because I'm not critical nor have I had a heart attack - will be significant. This is not going to happen any time soon. This diagnosis has ramificacations well into the future. Plans are going to have to be scrutinized and in many instances scheduled dates outright cancelled. Trips out of the country especially are going to have to be suspended until after the recovery which is also significant. The doctor wants me on beta blockers which means weaving will be difficult, which means overall physical fitness will deteriorate during the wait. I will probably have to cancel shows, which means no income. I am trying very hard right now to find the silver lining. Here we all are at the end of the week. Tired, yes. Happy? Hope so. I know I am. We covered three main weave structures in Level 2 - Twills, Overshot and Double Weave/Wide. In addition to this we looked at cotton fibre characteristics, touched on Profile Drafting (as one way to explain the similarity or connectedness of twill and overshot), some wet finishing (because, you know, I'm me) and the class did their Oral Presentations on Friday morning. There were a few other things in the booklet as well. We also talked a bit about ergonomics and efficiency (again because I'm me and I do have these soapboxes). 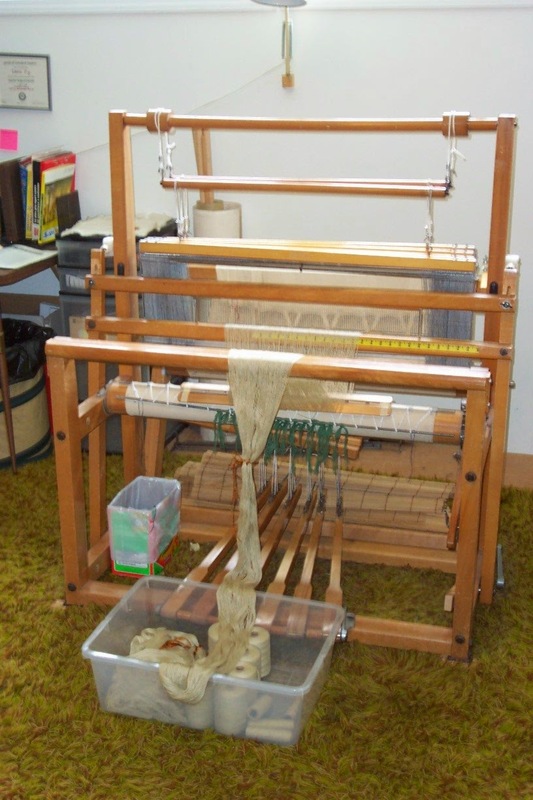 The Olds program is geared towards helping people understand the basic principles of weaving. It doesn't just cover the weave structures but tries to bring all those other things that go into making good cloth as well. It is an approach that resonates with me at a deep personal level - it is essentially my own approach to the creation of cloth. The certificate requires the student to attend 4 levels with a final Independent Study. A student could complete it in 5 years or they can repeat years. Sometimes Life Happens (ask me how I know) and a student can't get to all of the homework. And it is a significant amount of homework - I think someone estimated about 100 hours. The students attend the class in person for instruction and feedback during Fibre Week and then go home with the course booklet outlining the homework required. Homework needs to be submitted in time for marking before registration opens for the following year, so about 9 months in which to do the 100 hours. It was very heartwarming this year to see the growth of students in the Beginning Weaving class, and the good number of students doing Level 1. I'm hoping that they all pass and move on to Level 2. It looks good that Level 3 will proceed next year - 6 students in my class, plus there are several people who took Level 2 last year. We are now officially half way through the week. There have been some ah-ha moments, which is what we are aiming for. When I am teaching, my goal for my students is that they go home knowing more than they did when they arrived. Whatever that means for them. Olds College - and many dedicated volunteers - is/are working very hard to make a program that gives a consistent and well rounded body of knowledge to the students. The certificate program consists of four levels and covers the basic weave structures plus additional information that I feel is necessary for an understanding of how to create good cloth I.e. Cloth suitable for its purpose. 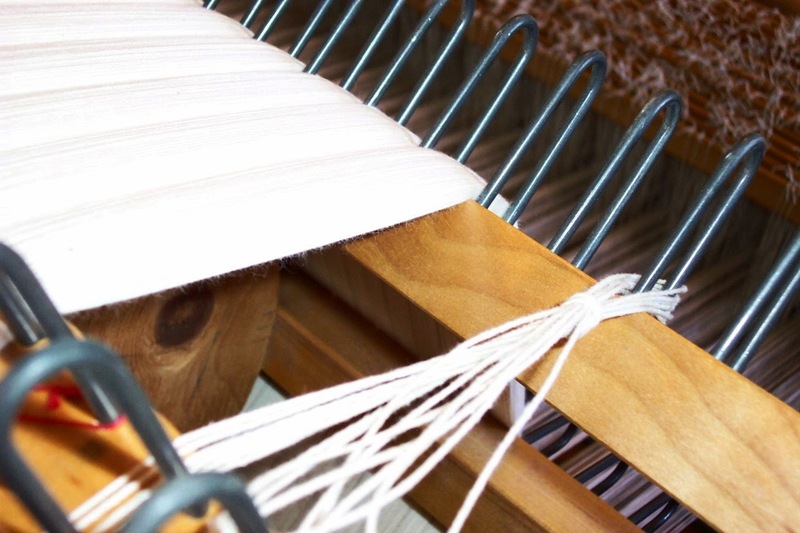 Weaving can be approached in many different ways. The practitioner can follow published patterns, or design their own. How one chooses to follow the craft is a purely personal decision. For me, designing my own is a big part of how I feed my creative urge. But not everyone feels that impulse. They may not have the time, or they may not feel confident about being able to do it on their own. In the end, weaving is weaving. By teaching I hope to bring a greater understanding of the craft to the student. I don't pretend to know it all, but I usually know what references to go to in order to find out what I need to know. The craft, the technology, of weaving is so vast that after nearly 40 years of weaving I still learn more stuff. That aspect - of being a perpetual student - is part of the attraction. Learning is fun. Learning is challenging. Sharing the knowledge is the cream on the top. We took it easy getting here, leaving Friday, stopping over at Hinton, AB, then continuing the rest of the way to Olds on Saturday. We arrived early enough that we were able to erect the booth structure and begin setting out yarn before the hall closed just after 6 pm. This morning we were back by 9 am or so to finish setting up. Doug has some tweaking to do with the wooden things from Don George but basically everything is under control. It has been a struggle to dial back my participation and bear in mind that slow and steady is the approach for this week. I tell people I am healthy, but I'm not, really. I have several chronic health issues and one of them seems to have exploded to the point of requiring immediate treatment. I'm hoping the least invasive will be all that is required but until they do the test, I won't know for sure. Yes, it could be serious but I'm under care and I just have to get through this week. So, although I'm not what you might call healthy, I am quite physically fit, more so than many people my age (and less than others - I'm not trying to claim more than I am). Bottom line is, though, that because I have a reasonable level of fitness I am confident that if the more invasive procedure is required, that I will come through just fine. Cancelling my involvement in Complex Weavers is a disappointment, but there will always be another conference. Once again I have had to learn the lesson of not growing too attached to my plans because sometimes the universe, god, what have you, has other plans for me. While I am happy about that, it means I will not be attending Complex Weavers Seminar after all. 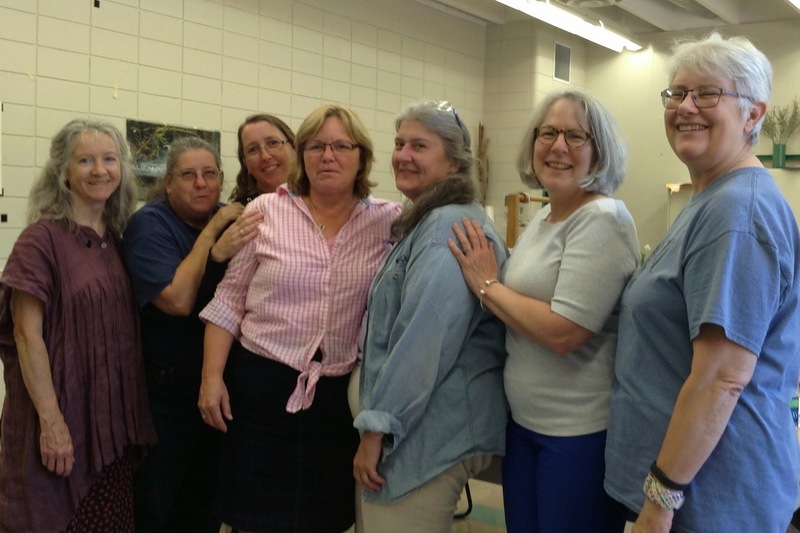 It is a huge disappointment to not go and be able to visit with other weavers, many of them known primarily via the Internet. I was looking forward to face to face interactions and to not just see but actually be able to feel the textiles. But once again I had to cancel. But such is life. High points, low points, sometimes both at once! Life keeps tossing small grenades at us. Nothing critical, at least not yet, and I'm keeping positive thoughts that they will have been more flash than bang. But of course I have also been up to my old tricks trying to squeeze one more thing into my schedule here, one more there, generally at the cost of stuff that needs to be done before I leave Saturday in the early morning. Or at least as early as I can pry myself out of bed. Saturday will be the summer solstice, therefore the longest day. The good news is that there won't be any driving in the dark, either to Alberta, or hopefully, to Tacoma the following weekend. Now if the weather co-operates and stays dry I will be a happy camper. Since I've never taught at Olds before I have no idea what they have for equipment so today I have been adding yet more stuff to the pile. Doug has already filled the passenger footwell and seat of the van and since I will be driving the truck, will have stuff crammed into every nook and cranny of the rather small Ford Ranger - my chariot for the trip. Yes we are taking both vehicles because Doug will come home while I carry on south. Yesterday the shop that I've been working with for quite a long time trying to find a product they like and think they can sell posted photos to Facebook of their new deck chair and wala - one of my towels was in the basket beside the chair. The designer will send me a glamour shot of the towel soon so I can share. This product has been a long time in the making and I'm very happy she is happy. 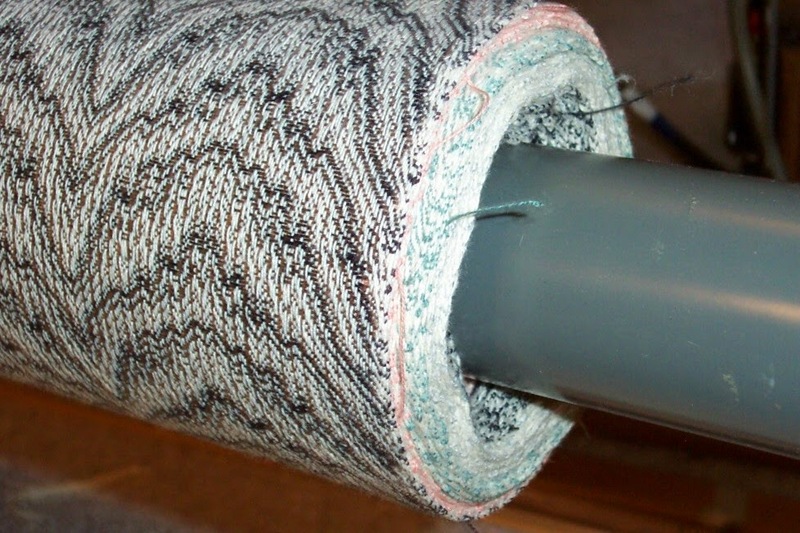 Today I threaded the tea towel warp on the AVL, finished the teal mats, beamed and threaded beige mats on the Leclerc. I was hoping to test drive the warp on the AVL because the plan is to use up some of Lynn's linen as weft but I think I've run out of time. Tomorrow morning will be taken up completely with personal stuff and I still have to finish packing my clothing and other miscellaneous stuff that I need for both destinations. If I get anything in the studio done at all it will be a bonus. There is still the beige mat to sley and tie up, the teal mats to cut and serge, never mind any weaving. But at the end of this trip I will visit with a couple of friends for a while so I'm looking forward to that, being able to kick back and enjoy them in person instead of at a distance. When I come home it will nearly be time for the Big Reveal on the Big Project from May. Plus I will have to hit the looms hard in order to continue building up inventory for the coming fall sales. I am hoping that the mad scramble will be over for a while, though. I just managed to squeak the last towel out of this warp. Fifty yards = 20 spa towels, which is pretty much what I'd calculated. The reason there is so little warp left is because I used up about 48" weaving a colour gamp for the designer's approval. Now I know that my math was pretty much spot on, which is reassuring, given how often I make mistakes! Next I'm going to beam a 'quick' tea towel warp, this time beaming from the top of the tube instead of the side. I think I tried that before and it didn't work terribly well because the yarn fell off the bottom of the tube and wrapped around the spindle, but I'm not sure and if it works it should give me a better tensioned warp. This one had mild issues with unequal tension on individual ends causing them to not open a clear shed, therefore causing weft 'bubbles' which I'm having to labouriously pull through the textile to the selvedge and then sew in. Not efficient! I'm thinking that if I do the tubes I might look for something I can put on them which will prevent the yarn from sluffing down and wrapping round the spindle. Since I just tossed out all the plastic netting I used to use for that purpose, guess I'll be heading to the dollar store to get bath scrubbies. Proving once again that you should never throw something out because as soon as you do, you need it! Mending station. Hemming station. Knitting. Etc. My house will never win the Good Housekeeping Award at the best of times, but right now it's entering into a not-great zone. In the meantime while he's busy with that, I've been working on the 50 yard warp (nearing completion in spite of loom/computer woes) and last night I cut off the towels for the order and started burling and mending. I managed 2.5 towels before I gave up last night. It's tedious work (i.e. I'm not finding it much fun, but it's necessary) and with 2/16 cotton warp and weft, not easy to see. 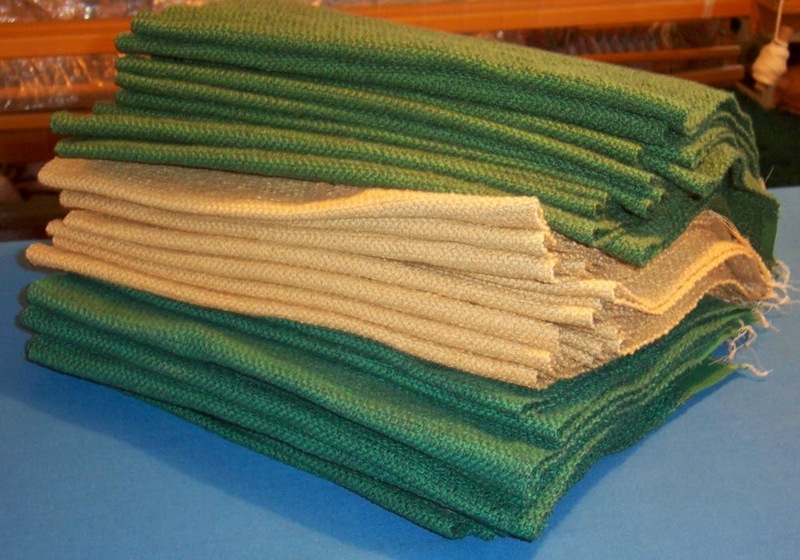 Under the bin of towels, there is a bin of place mats wanting hemming as well. To the left I'm starting to build the stuff needed for the trip to Olds and Tacoma. In other words, things are going to get a whole bunch worse before they get better. Add to that my back continues to ache and pinch and I'm not sure why it's not settling down given the number of appointments with the chiropractor I've had. Next week I've got medical appointments (back and tests to see if we can figure out what's happening with this body - other than getting old and decrepit) and then on Saturday I leave for two weeks. Please send good vibes for excellent driving weather. It's going to be a very long trip. So many people think that working efficiently is somehow 'hurrying'. In fact, hurry is the opposite of efficient. I saw a classic example of someone hurrying to get a job done a while ago. She was feeling under the deadline pressure gun and working as quickly as she possibly could in order to get the task she was doing finished. Unfortunately when your approach to your activity is to 'hurry' you can wind up in more trouble than if you'd just slowed down, paid attention to what you were doing, and worked efficiently. Working efficiently is to approach the task at hand with the attitude of minimizing the effort required to do something. You understand how your tools work and do not try to force them to work beyond their capacity. You methodically do each step in its order, not trying to take short cuts. Your concentration is on what you are doing, not on what you will be doing when you are done - hurry, hurry, hurry! In the end, the person who was hurrying wound up making a mess, not once but twice. Instead of 'saving' 5 minutes by rushing through what she was doing, she 'wasted' 20 minutes (each time) trying to undo the mess that had been created. People who have mastered their craft and can work efficiently should be admired. OTOH, I have seen comments made by people after a video clip was aired commenting in a negative way. Why disapprove of someone who obviously works well, knows their equipment, materials and honed their physical skills to the point where they can do the task with the least amount of wasted effort? How is their expertise any commentary on anyone else? Our only job is to become a better person, a better weaver, than we were yesterday. We are not here to judge others for their expertise, or lack of it. It is of no consequence to me how anyone else works. If someone else wants to achieve my results, however, they might like to look at how I work, the processes I use, the tools I have obtained. I'm not saying everyone should weave as quickly as I can, just that if they want to improve their skills they should study how others they might admire do the things they do, find the processes that work for them and then work to improve their own skills. I wear these bicycle gloves while weaving with the fly shuttle. The reason I started was that a while back I went to the gym to get fit and wound up pinching a nerve in my neck which caused my hands to go numb. Weaving was agony. At the time I was primarily only weaving on the AVL with the fly shuttle so I started looking for things that would help. In the end we did a few different things, but one of them was buying impact gloves. They are made for people using impact tools like jack hammers. Unfortunately they were extremely expensive and were sold individually so when my hands recovered, rather than invest in new impact gloves I started buying bicycle gloves with lots of padding in the palms. I don't use them when I'm hand throwing the shuttle as they kind of interfere with my ability to catch and throw the shuttle but find that they do seem to help my neck/hands when using the fly shuttle. Lest anyone think weaving is a romantical, sedate, non-stress activity, the wear and tear on these gloves should give an indication of what forces the body needs to tolerate. 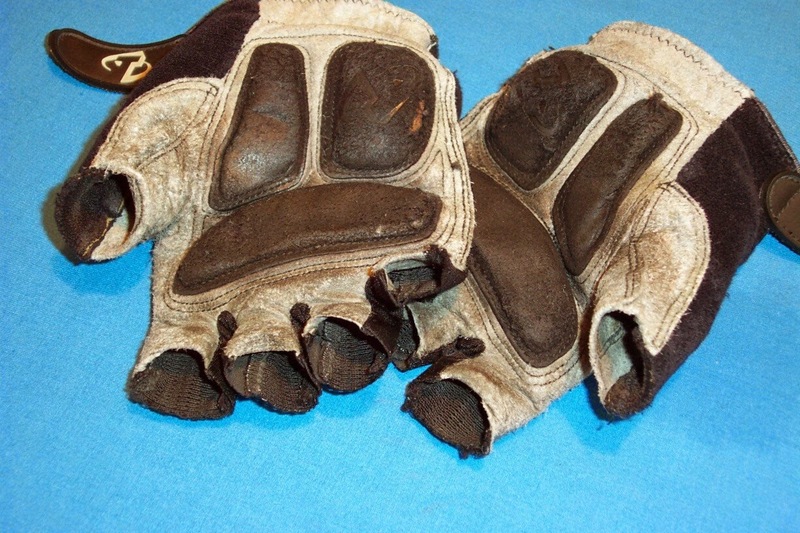 The gloves are pretty much worn out so I will have to hie myself to the bike shop and see if I can find another pair. Sometimes Life Happens and Things Change. Or Need to be Changed. With my back taking so long to settle down I have had to radically change my expectations. Normally I would count my productivity in how many yards I weave in a day. Right now I have to count how many inches. Because 120" sounds so much better than 3.5 yards. Or in how many units I get done rather than how many warps. Before my back went wonky, I could easily weave off an entire 11 meter long (15 mat) warp in a day. But I'm finding weaving on the Leclerc a lot more problematical than weaving on the AVL. It's the step on the brake release, bend sideways, crank the warp forward, really crank on to reset the tension that is being the most bothersome. So I am trying to listen to my massage therapist and chiropractor and not sit for 'too long', walk lots, and carefully monitor what my back is telling me. And count progress in inches rather than yards because it's all progress, right? Right now I'm doing a whole of the 'same' thing. With 50 yards on the AVL and a run of place mats happening on the Leclerc, there is a whole lot of same happening. And that is just fine by me. 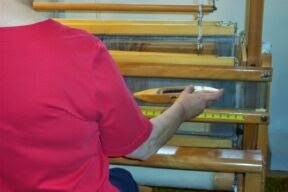 In spite of my back still not right, I have managed to weave a little on one or other of the looms every day. I am over the half way mark on the AVL, and approaching the half way mark on the place mats. Sometimes things turn out better than hoped. 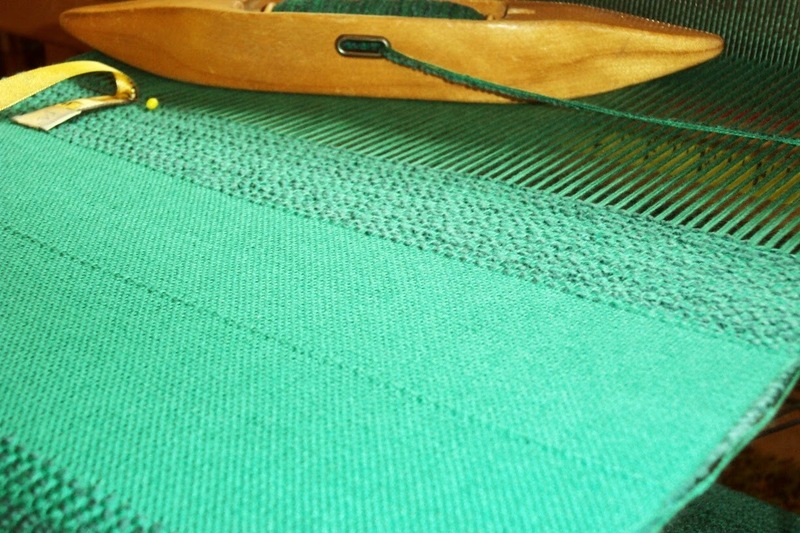 With the place mats I could not, in most cases, get a perfect colour match to the thick cotton for weft. Going with 'close enough' I ordered in the yarn from Brassard and wound warps. In the end, the slight variation in colour has enhanced the textile, giving some visual depth or texture as well as the actual, physical, texture. Warp at about the half way mark - it's slow going with needing a temple and trying to catch the weft loops that bubble up in the shed. However, I am at the half way mark! 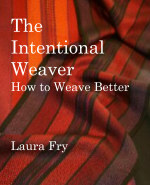 I'm doing four different weft colours and weaving them in rotation so that I have an equal number of each colour. Or at least as close to an equal number as I can get. I 'sacrificed' a yard or so weaving colour samples for the designer so I may or may not wind up with an equal number of colours. I'm actually hoping to get 21 towels from this warp, not just 20, but we'll see. It will also depend on whether or not I have sufficient weft because I didn't order any 'extra' of the yarn, not knowing if they were going to sell and I'd be making more, or not. My stash of yarn is quite large enough without my buying more on spec. I have also been doing a lot of thinking about the future. I will turn 64 this year - I am no longer in my mid-30's - and have to face the fact that I am slowing down. This body that I wear has sustained injury and suffered ill health - and that isn't over. Nothing to regret, I've used my body and it has served me well. But I cannot continue as I have been - that's just not on. Over the past few years I have gradually discontinued doing some of the myriad things I had been doing. Each of them brought in a small amount of income; each was necessary for me in order to pay the bills and keep home and hearth together. But next year, well next year I can start collecting my pension. It won't be much, but it will be every single month. No more scrambling, watching the balance in the chequing account dwindle, wondering what I could do next to bring in a little cash flow. So I have stopped dyeing yarn to sell. I have stopped producing my own publications. I have stopped (after Olds) doing yarn shows. What is next? Perhaps traveling to teach - that depends on my health continuing to be reasonably good. I am throwing more effort into 'remote' teaching - blogging on Craftsy, the seminar on the Weaving Today website (link in yesterday's post), done the latest Big Project. 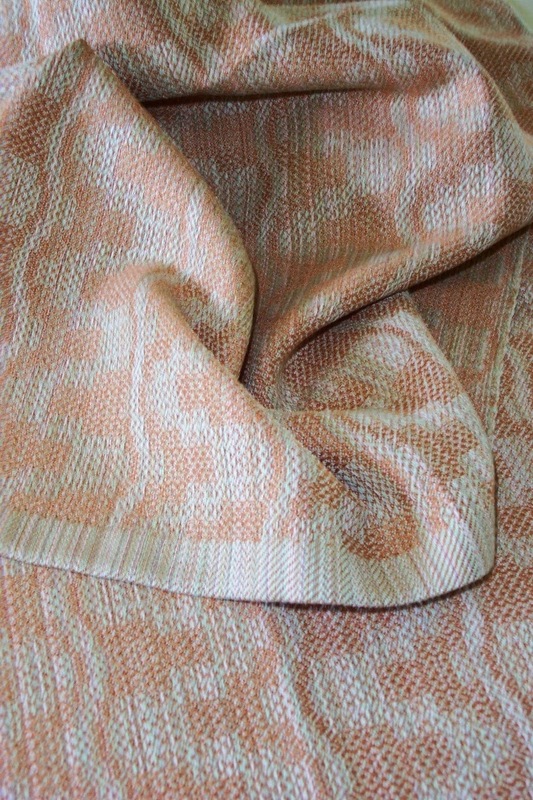 I have an article due to appear in Handwoven and Fibre Focus (Ontario Guild magazine) this fall. The towels above are for a designer who hopes to market them through her store. I will continue to do four craft fairs - until they aren't lucrative enough - in the autumn and therefore need to produce inventory for those. And I continue to look for other ways to teach remotely via the internet. But I still have publications to sell, so once I get home from the next trip, stay tuned for an announcement about that. Ultimately I want to simplify my life. All of those things I did required tools, equipment and materials, not to mention the shipping stuff in order to mail them away. I'd really like to get rid of some of that stuff. Anyone want an electric stapler, for instance? One of the things I did a few years ago (quite a few years ago - pre-internet days) was take a class on marketing. One of the sessions was on Customer Service and Satisfaction. One of the bits of trivia that stuck in my head was that a happy customer will generally tell 11 people how happy they are. An unhappy customer will tell around 27. Now that's just an average - some people tell a whole lot more, some less. But that was in the days before the internet. Nowadays, if one of those 'people' you tell about your experience is Facebook, or one of the chat groups, the number goes up exponentially. Recently someone posted to Facebook that she had had another poor experience with a product and she vowed to never ever purchase a similar product again. She effectively painted that entire product line with the same brush (bad). Anyone reading of her bad experience will no doubt avoid that product. After all, why waste your money? But what if her experience was quite specific to that particular product? What if the fault lie in the format, which didn't appeal to her but might to others? What if it was the presenter? Someone else might have felt they got good value for their money with that product. Or with a different topic. Or a different presenter. As someone who has things to sell, the greatest gift anyone who has purchased one of my products is to tell their friends if they are happy. But not just say you are happy, but what benefit you derived from it. I just checked the Weaving Today website and looked at the webinar I did for them last year. Now I know people have watched it - some of you have emailed to let me know. But I also noticed that no one has posted a review! Therefore anyone looking at it today, seeing that it was first 'published' last summer and that it has no stars, no reviews, will surely wonder if it is worthwhile to take - after all no one has said they found it interesting or valuable. Do they dare sign up and potentially waste their money on a 'bad' product? With the next Big Project set to launch in mid-July I ask that if you purchase it, find it interesting, valuable, worthwhile, please let your friends know. I ask this not just for me but for all of our hard working instructors. It's how we make our money, how we fund our passion, some of us, even put food on the table. For whatever reason, today I feel like I'm running from stick to stick, trying to keep spinning plates from wobbling and falling to the floor with a crash. I can't seem to settle to anything - perhaps it is the unsettled weather we are having - sun one moment, blustery wind, pelting rain, lashes of hail. Repeat. There is, as well, the issue of a few critical deadlines approaching, rather more rapidly than I feel capable of managing. Feeling overwhelmed with it all, I went to knitting drop-in and enjoyed an hour or so of listening to the chit chat, inserting a comment here and there and working the needles. Since getting home, though, I have flitted from here to there to back again, thoughts like fireflies, never alighting anywhere for long enough to be considered truly productive. Just to add to the confusion, I've just emailed the Handwoven editor inquiring about the specific deadline for an upcoming issue (can't seem to shut the creative juices off!) and which will, no doubt, fall smack in the middle of the rest of the deadline crop I am already ignoring. However, I have managed to work on a few things - green mat warp cut and serged, and the next mat warp ready to be beamed. 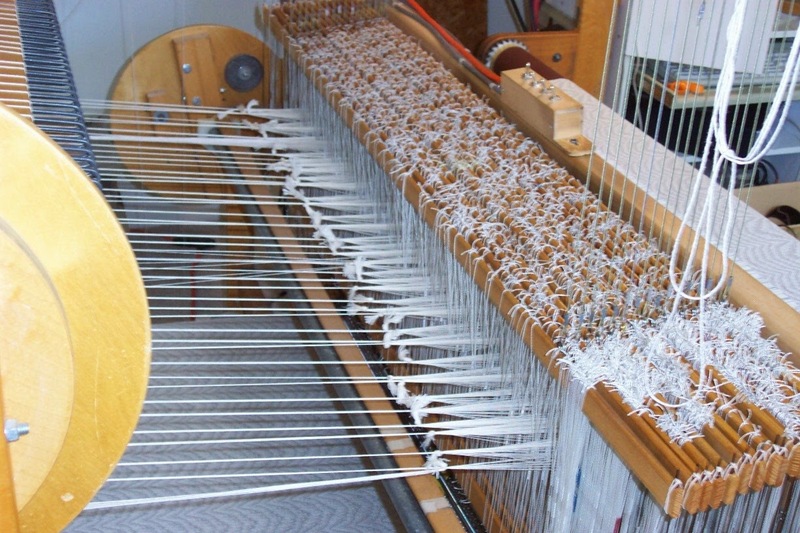 After taking stock of the 50 yard warp, now about half woven, the pending t-storm, the stack of paperwork that needs doing - I decided to wimp out and not fire up the AVL in case of a power outage and work on other stuff. I can go back to the AVL tomorrow, hopefully feeling refreshed for having taken a break from that warp. Today is Wednesday. At some point in the next few days I have to go to the guild room and re-arrange it for the sale/demo event on Saturday, pack up and deliver to the room yarns I have for sale, bring my ledger up to date and balance my cheque book (both of them, business and personal, both woefully late), pull the books/reference material for Olds, start packing for Olds and Complex Weavers Seminars. I am awaiting replies to a couple of emails regarding potential work for the future (i.e. after CW Seminars) - because you know, I didn't have enough deadlines in July and August. We leave for Olds in two and a half weeks and in between I have maintenance appointments, blog posts to write, studio deadlines and Life Happenings. Status quo, then. Spin, plates. Spin! 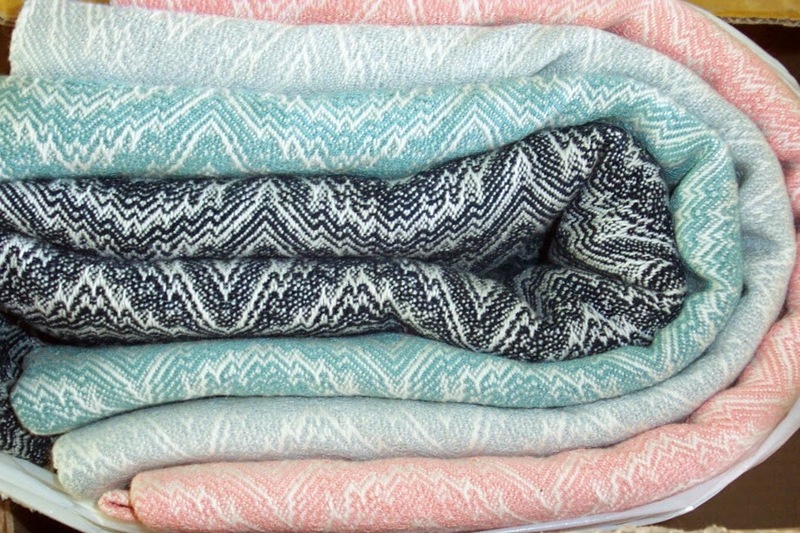 First four 'spa' towels ready to be shipped - love the way individual threads magically turn into whole cloth after wet finishing. Progress has been much slower than I would like due to a couple of things - my back is still giving me fits so I have to pace myself more slowly, then the loom started giving me fits - the treadle switch starts sticking after I weave for about 40 minutes. However any forward momentum has to count as progress, right? Read an interesting article this morning on Facebook about how human beings perceive the passage of time. Coming from a North American background, heavily grounded in European heritage, I am very much a linear in terms of how I perceive time. However, I also have a good appreciation of the cyclic nature of time, as well. 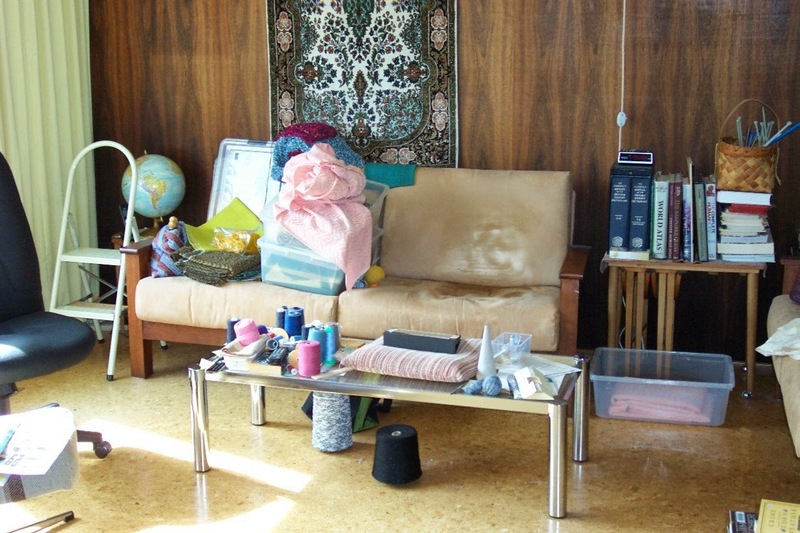 You can't ignore the various cycles of life, especially as a self-employed crafts person. As such it is a constant round of shows and preparation for them. So while I think in a linear fashion and count time as precious, I am aware of how the seasons change, the show schedule works, how the year passes from one deadline to the next. I suppose in some ways I see time as a year long spiral - sort of like a slinky - where I steadily and purposefully work my way around the coils of the year. I also put a much greater value on relationships than I do on material goods. But time, after all, is a human construct. Is it any surprise that different cultures perceive it in different ways? There is perhaps 35 yards left on the 50 yard warp I've been working on. I'm at the pure 'slog' stage, now. There is a poster on Facebook that begins something to the effect that creative people are easily bored. I don't think so. I don't think creative people bother to invite boredom into their lives. I know I don't. There are always so many things that either need doing, or that I want to do, that boredom just doesn't feature in my life at all. I can't afford to be bored. 50 yards = 1800" @ 32 ppi = 57,600 picks. Give or take. Daunting? Perhaps. But that is what I needed to fill the order and rather than dress the loom twice with a 25 yard warp, I did the 50 yards. That way I only had to thread it once. And I only had loom waste once. Do I get bored weaving this? No. I listen to my music, get into my 'zone' and just get 'er done. The only way to do that is to show up and do it. Don't moan about it. Don't dread it. Don't regret putting it on. Stay in the moment. Know that this, too, will end. But only if I show up and do the work.